Well-maintained heating systems generally emit a slow and steady hum. Any type of noise other than this could be a sign of heating problems, and should not be ignored. 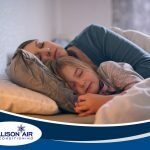 Allison Air Conditioning shares a list of some of the most common noises that heating systems make and what they usually mean. Buzzing – Buzzing is common in heating systems that consume fuel, such as furnaces and boilers. It’s important to note that buzzing doesn’t always indicate a problem, though you should check for the source of the noise just to make sure. A buzzing control unit could be evidence of a failing voltage transformer, while a buzzing blower could indicate problems with the fan motor. Loose components like improperly mounted brackets may also create a buzzing noise. Creaking and Popping – Certain types of heating systems creak and pop when starting it up after a long time of not being in use. This is due to thermal expansion and contraction caused by differences in temperature. These sounds are normal and should stop within a day or two of continuous operation. Rumbling – The furnace or boiler may also make a rumbling sound when starting it up for the first time of the year. You can expect this noise to fade away after a few hours of operation, but you should have your heating system professionally inspected if the rumbling persists. Loud Bangs – Proper shutdown procedures should be observed when turning off your furnace or boiler for the season. Otherwise, it may make a loud and explosive bang when turned back on. This banging sound is caused by unburned fuel that’s left in the oil pump when the unit is shut down improperly. If smoke and soot follow the banging sound, turn off your heating system and call an HVAC technician for repairs. Shrieking or Grinding – Heating systems have bearings and moving parts, and without sufficient lubrication, these parts can make shrieking or grinding noises. The same thing can also occur when loose pieces are dragged by these moving components. 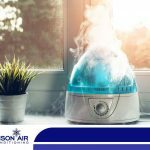 In any case, these types of noises need to be addressed by an HVAC technician before the unwanted friction can cause further damage. 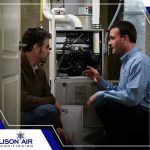 To learn more about how to address heating system noises, call Allison today at (951) 356-4224, or fill out our contact form to schedule an appointment. We also offer free estimates on new installations. Short Cycling: Does Your Furnace Turn Off and On Too Often?